The Department of Adult and Pediatric Thoracic Surgery at the HELIOS Clinic Krefeld offers the full range of services in this medical focus. The main specialization of the department is the diagnosis and treatment of lung cancer, lung metastases. In addition, the department's scope of tasks includes thoracic biopsy, surgical treatment of suppuration in the pleural cavity, chest defects, tracheal surgery, lung volume reduction surgery. The surgeons of the department have a unique experience and expertise in the field of thoracic surgery in children and adolescents. The department is headed by Dr. med. Martin Hohls. The optimal treatment option is selected at tumor boards, during which each clinical situation is considered. With the availability of necessary indications, adjuvant therapy may be provided. When being diagnosed with cancer, the patient experiences a great emotional shock, and therefore psycho-oncological care is an integral part of treatment. The treatment of lung metastases is conducted with a modern high-precision laser scalpel, which provides the most accurate removal of the affected lung tissue. Compared to the traditional surgical treatment, this method is more sparing, as patients recover quickly, and surgeons manage to maximally preserve lung function. It should be noted that the department maintains close cooperation with many specialists from the related fields, which guarantees an interdisciplinary approach to treatment and effective treatment outcomes. May 1989 - November 1995 Study of Medicine, Friedrich Alexander University Erlangen, Germany. November 1995 Medical licensing examination, Friedrich Alexander University Erlangen, Germany. March 1997 Doctoral Thesis, Friedrich Alexander University Erlangen, Germany. Subject: "Comparison of two fT3 radioimmunoassays: Studies on the diagnostic accuracy, the influence of concomitant medication and the frozen storage of serum samples". August 2006 Board Certification as General Surgeon, Germany. October 2008 Board Certification as Thoracic Surgeon, Germany. February 1996 - August 2000 Surgical rotation in England, the last 2 years at the Royal London Hospital. September 2000 - March 2002 Assistant Physician, Department of Thoracic Surgery, University Hospital Freiburg, Germany. April 2002 - October 2006 Completion of general surgical training and training in trauma and orthopaedic surgery at the hospitals of Krefeld and Duisburg, Germany. November 2006 - March 2008 Assistant Physician, Department of Thoracic Surgery, Hospital Cologne Merheim, Germany. April 2008 - October 2008 Assistant Physician, Department of Adult and Pediatric Thoracic Surgery, HELIOS Clinic Krefeld, Germany. November 2008 - July 2010 Senior Physician, Department of Adult and Pediatric Thoracic Surgery, HELIOS Clinic Krefeld, Germany. July 2010 - December 2015 Leading Senior Physician, Department of Adult and Pediatric Thoracic Surgery, HELIOS Clinic Krefeld, Germany. 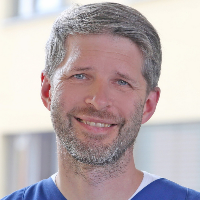 Since January 2016 Chief Physician, Department of Adult and Pediatric Thoracic Surgery, HELIOS Clinic Krefeld. Department of Adult and Pediatric Thoracic Surgery.